The virtual worlds are dead... Long live the virtual worlds! 3. recruit talented people online: France BNP Paribas is a leader in innovation & recruitment. They ran a v-recruitment campaign on Second Life in 2007 and they currently providing online games such as Ace Manager or Starbank. Even in the current context, especially in the current context, it is critical for financial institutions to be seen as innovative to attract the best talent out there. But HR Teams are challenged to achieve their ambitious targets with smaller budget. It is time to be smarter, and embrace social media to initiate conversations, increase your reach, change brand perception, and eventually convince your future leaders to join your organization. And remember that your employees are your best advocates: give them a voice and turn them into 'rockstars'! Today AllState is running a Virtual Career Fair where their employees will interact with the virtual audience and share information regarding Allstate employment and business opportunities. There are three main sections to the site: the virtual fair itself, the auditorium with on-demand resources on recruitment, and the Networking Lounge. For more info, I invite you to watch the demo. EverythingCU.com is the premiere online resource for credit union marketing professionals. In the last ten years, it has become the central hub connecting thousands of credit union executives across the country. They recently introduced a new service, PlumWall, which is a new way to display and share member testimonials and stories, as well as displaying local and national general news stories and features about credit unions. I invite you to check the Everything CU World 2.0 Adventure blog. Morriss is a great guy: he is passionate, very knowledgeable, and a lot of fun to be around with. Morriss is extremely well connected in the Credit Union world, and he is regularly asked to deliver presentations and workshops to Senior Executives throughout the US..
You can find Morriss on linkedin, facebook and twitter @mmpartee. Morriss and I were sitting together during Finovate and at the end of the day we had a lovely dinner with Charis Palmer and Nichelle Stephens. I shot my interview with Morriss at the Restaurant which was quite dark. But again I am confident you will find the content very insightful. We talked about social media initiatives from Credit Unions, their focus on members - transparency - advocacy, the social media champions from the industry, the most engaged Senior Executives. I invite you to watch my interview with Morriss. Please find below the presentation I will give today at SOMESSO Zurich 09 with all the relevant links. Slide 7: Still doubting the Power of Social Media? * The Facebook Group: HSBC Stop the Great HSBC Graduate Ripp-Off!!! * YouTube Video: Debtors Revolt Begins Now! Slide 14: Severus CU's "Young & Free in Alberta"
* Slidehsare - Tim McAlpine's "Young & Free: Building Relationships Through Social Media"
Slide 24: Deal w/ Hacking & Don't Be the Spammer! * Financial Institutions + Spam + Twitter #1: You've been hacked... So what? Deal With it! * Financial Institutions + Spam + Twitter #2: Don't Be The Spammer! And above all, find the best way to REWARD people for visiting, contributing, sharing, and promoting your initiatives! I would be delighted to have a chat with you about your social media strategy, so please do not hesitate to call me on +44 7736 446 357 or send me an email to christophe[dot]langlois[at]visible-banking[dot]com. I met Matthias Kroener, Founder at Fidor Bank AG, for the first time in Paris at the EFMA event on Social Media earlier this year. I invite you to check my post on Ficoba and my wrap up of the event. Referring to my wrap up of Finovate 2009, Matthias told me he wanted to prove bankers wrong and demonstrate Financial Services companies could be fun and have real fans such as Apple or Amazon. Bring it on Matthias, the industry needs new and fresh approaches to banking such as Ficoba, Mint, UBank or SmartyPig! I look forward to catching up with him next month in Zurich at SOMESSO, "Corporate Social Media in the Finance Sector", where we are both speaking. I recommended Matthias who I believe will be a perfect fit with his vision and his presentation skills. - combines the behavioural patterns of stock trading with "thrill" and "fun"
- no investment-banking-black box in the products and applications, therefor very transparent. A combination of FUN and BROKERAGE." They started their Private Beta and invited just 30 people to contribute. I just had a quick call with Matthias who told me that I was the only blogger to be invited to share his feedback at that stage. Das ist Wunderbar! I can't tell you much more info at that stage, but the service is currently divided into three main sections: 1x2 Financials, Best Performer, and Easytrader. Stay tuned on Visible Banking for an update later this year! Please note that later today Matthias will give a presentation at the exclusive Techcrunch Munich event. The title: “With traditional banking dying, and community banking up, what does this mean for the startup economy”. Congrats Matthias! Bienvenido a HipoListo.es la versión española de Smarthippo.com! Last week has been an important week for SmartHippo.com the first-ever website that uses the power of community to help consumers find the best mortgage rates and save money launched its beta version back in September 2007. Not only they introduced their new CEO Lori Collins, who was one of SH's founding Advisory Board members as well as the former GM at LendingTree, but they also announced the launch of HipoListo.es, their new Joint-Venture with Financialred in Spain. I first heard about SmartHippo in early 2008 on Jim Bruene's excellent Netbanker blog. I met George Favvas, Founder and now VP Corporate Strategy, at FinovateStartup 2008 in San Francisco. I invite you to watch my interview with George (shot in April 2008). I invite you to read the official press release. At the moment, the HipoListo homepage is a carbon copy of SmartHippo's but in Spanish. Please find below a quote from Jesus Perez Sanchez, CEO at Financialred.com. "The web finance space is in its infancy in Spain and we believe we have an opportunity to rapidly establish HipoListo as the dominant player in a market of 50 million consumers" said Jesus Perez, Chief Strategy Officer of FinancialRed. "By leveraging the SmartHippo platform we were able to significantly reduce our time to market." You can find Jesus on linkedin and on the finanzas20.com blog. I believe the HipoListo Team hans't started blogging yet. It is interesting to see two different approaches to Social Media and Advocacy which in Spain reflects the local market adoption of twitter: SmartHippo is focused on twitter, whereas HipoListo is focused on Facebook. 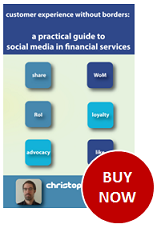 I love the Social Media / Online Inovation space in the Financial Services industry. It is such a small world. I met George through Jim, I first got in touch with Jesus when he was working at BBVA and I was Senior Innovation Manager at Lloyds TSB, and while I was in NYC three weeks ago to cover Finovate 2009, I met with one of Jesus' colleagues, José Ruiz Cristina - Chief Strategy Officer at Financialred and Avi Karnani the Co-Founder of Thrive and now VP Strategic Innovation at LendingTree, Lori's former employer. SmartHippo is not the only innovative startup in online finance which recently launched outside the US: in the last 12 months Wesabe partnered with the Telegraph in the UK and SmartyPig partnered with ANZ in Australia. I invite you to watch my recent interview with the SmartyPig Team (the 1st ever video interview with Bob Weinschenk their new CEO), and last year's interview with Marc Hedlund, Wesabe's CEO. Earlier today, I enjoyed finding the following twitter updates, new wall post and new note by Anderson Uvie-Emegbo, Head of Web Management & E-Media, on the UBA Group Facebook page. "As a listening and learning organisation, UBA's official twitter and facebook pages are focused on ensuring that we proactively engage you - your complaints, enquiries, feedback, etc. The results have been amazing!" So, what are you using Social Media for? To all my readers, please send me the links to any similar announcements from Financial Institutions all over the world. Nowadays, it is critical to monitor online discussions on your products, your brand, your competitors and your industry. Brands must show they listen, acknowledge that people's expectations have changed, and demonstrate that they care. It is also important to identify your detractors and your advocates, and start asap to build trusted relationships with the most influential ones. I invite you to watch my interview with Jim Issokson, VP Reputation Management at MasterCard Worldwide shot in NYC two weeks ago the day before Finovate 2009. UBA is not the only financial institution in Africa which is doing a good job embracing social media: I always use First National Bank's FNB Premier Banking page when I share my best practices on Facebook: not only they produce interesting and fresh content, but most of the time they respond to their fans, and their CEO, Robert Keip, even spent some time shooting a video to welcome Facebook's users. Refreshing and brilliant. It is interesting to notice that detractors in South Africa are smartly leveraging social media too. I invite you to check the Standard Blank initiative initiated by a few angry customers earlier this year. Their more and more popular twitter accounts and online community on Ning helped them gain some good exposure online. 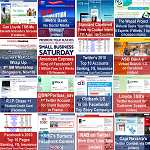 I invite you to check my social media directory which is the most comprehensive list in the finance industry. And please don't hesitate to flag any missing initiatives! I have already sent a few updates on twitter about the newly redesigned OPEN Forum community (check the email sent to their members on the left handside), but it is such a good redesign that it is worth dedicating a few minutes this afternoon to write a proper post on Visible Banking. Social Media is all about people. Don't reinvent the wheel and don't spend too much money on the interface! Unfortunately this proved to be too costly to Join2Grow.biz, the innovative online community for european entrepreneurs launched back in February 2007 by Fortis Bank in Belgium, which shut down just two years later. Success lies in your ability to convince people of the value of your platform and to give them a good reason to use it. It needs to be intuitive and simple to register and use. Then you must find the most appealing ways to REWARD your members for visiting, contributing and promoting your platform. One of your initial key hurdles will be to drive adoption of your platform and reach a critical mass of users. Let me reassure you: your interface won't be perfect at launch and that is not a big issue. You will observe how your founding members are using your platform, then you will ask them to share their comments and suggestions. You will take those ideas into account, review them, categorize and rank them, and you will deliver the ones which will have the biggest immediate impact. Simple, isn't it? Since 2007, most of the online communities launched in the Finance industry (banking, financial services and insurance) happen to target the Small and Medium Enterprises (SME) market which does make sense. Indeed, entrepreneurs are seeking new ways to increase their recognition from their industry and give more exposure to their business. If executed well, an online community is the best place to network, find useful information, share with your peers, and trade. But very few communities have managed to sustain a decent growth and generate a good amount of activity: I would like to mention two of the most successful communities: Ideablob w/ bloblive by Advanta (congrats to Ami Kassar and his innovation team) and the award-winning smallbusiness online community by Bank of America. But let me get back to the OPEN Forum. It is rare to find an online community with a simple and sleek interface, and with the right level of features. It shows me that American Express worked with subject matter experts who really get social media. At Visible Banking we too are totally focus on helping our clients leverage social media to drive client and employee engagement. Social Media is all about people, not technology. 2. Twitter integration - I invite you to follow OPENForum on twitter. It is quite rare to find a major social media initiative from a financial institution with an embeded live twitter feed. Bloblive (used to?) and UBank's thank you page also include live twitter feeds. To reach your crical mass of users and attracts potential new customers, you must make your online community as open as possible and at the same time you need to find ways to give extra value to your clients. I believe it is the first time I see a community achieving that. Bravo! I am not a huge fan of communities hosted (or worse 'embedded') on corporate websites which could be perceived as too salesy, but it works well for American Express. The community even has its own URL http://openforum.com. According to compete.com, it looks like OPEN Forum generates more traffic than some of the very best online communities in finance. Well done Amex. You deserve your spot as 48th most engaging global brand in Charlene Li latest study. It looks like butterflies are leading the way in Financial Services! You will find below a list of 20+ online communities in 10 countries (the idea generation platforms are not listed there). I invite you to check my social media directory to get the links and flag any missing initiatives. I look forward to contributing to a high-profile roundtable discussion on 'banking for the youths' organized and hosted by Google in Paris later today. Patrick Kervern, Industry Leader Finance, and Anissa Talbi, Senior Industry Manager Finance, invited me to share my passion for social media and discuss the key initiatives from North America and Europe focusing on the youths. The junior group (teenagers and young adults up to the age of 30) represents a very interesting market for banks and insurers. They tend to be a disloyal, fickle but informed sector. * Attracting juniors: Banks must capture youngsters at an early stage rather than later. This is a difficult group to attract and retain, so banks may need to adopt an aggressive pricing policy and offer exciting auxiliary products and services. * Keeping juniors: Once banks have attracted juniors, they must try and keep them and make them customers for life (if possible). Young people easily change loyalties, so banks need good offers and must innovate continuously to keep their interest. It’s important to use the right language as the attitudes and nuances of this market constantly change. In the last couple of years, financial insitutions have started to leverage social media to engage with the youths. Their goals vary from recruiting talented graduates to providing financial education to teenagers and young professionals. Let me share with you a list of social media initiatives from the banking industry focused on the Youth Market and sorted by country. Two years ago the ING Asia Pacific eBusiness team impressed me. I reviewed in details an innovative social media initiative in the life insurance space launched by the bank in India "pickuradvisor.com". After just a couple of hours David Garceran Nieuwenburg former Asia Pacific Regional Head at ING Group, now AVP - Asia Head e-Services at Sun Life Financial Asia, left a comment on my post thanking me and promising they would quickly address this issue. Just 48 hours later, I received another comment this time from the Head Marketing at ING Vysya Life Insurance in India to confirm they had already improved their moderation process. Very impressive. Please note that before canning the project last year, ING improved the interface and rolled it out in Hong-Kong in Chinese. David was instrumental in most of the social media experiments launched by ING in 2006 and 2007. David is a great guy. At last I had the chance to spend a couple of days with him at the event I was chairing in Kuala Lumpur in April 2009, 'E-Channel Management for Retail Banking'. This morning I was delighted to receive a tweet from Lars Millberg, Global Head of Trade Finance at SEB, who found my comments useful. Lars, it is a shame you couldn't participate to Chris Skinner's Financial Services Club event on social media and banking last Tuesday. An hour later, I received another tweet from Martin Björnström this time with a link to his response "Visible Banking comments The Benche" on The Benche blog. Lars and Martin, I can't wait to start working together on this high-potential project and helping you to take the Benche to the next level!